The trend for concealing the front ends of halfcab buses underneath what was to often later referred to as a ‘tin front’ was initiated in the immediate postwar period by BMMO with its homemade D5 model. Shortly afterwards, neighbouring Birmingham City Transport decided to follow suit and a different design of their own was hatched which was first fitted to a batch of Crossley DD42’s, but then also to subsequent Daimler CVG6’s and Guy Arab IV’s, giving the three different makes a totally uniform appearance. It seems likely that Crossley produced this particular design, which became known as the ‘New Look’ – a term then currently in use for the latest Christian Dior womens’ fashion styles. Daimler and Guy then adopted the design as the standard option on their models generally, but no more Crossleys were so fitted. However, Crossley had passed into the hands of the ACV Group, which owned AEC, and around 1952/53 a number of Regent III’s were fitted with the ‘New Look’ front – the customers being Devon General, Rhondda Transport South Wales, Hull and Bradford. However, clearly not wishing their products to resemble Daimlers and Guys, AEC soon got to work on producing a unique design of their own, which first appeared on the Regent V, then later graced Bridgemasters and Renowns, and even a few Regent III’s for Sheffield. Bradford City Transport 82 was one of a batch of 40 (66-105, HKW 66-105) delivered in 1952/53. Originally H33/26R, they had a couple more seats inserted upstairs in 1957. It is seen here under the trolleybus overhead in Glydegate (which no longer exists) – an extremely short street linking Little Horton Lane with Morley Street opposite the Alhambra Theatre. Just behind on the extreme right is the newly opened Museum of Photography, Film and Television. 82 was withdrawn in 1971, and after a long period in storage was acquired for preservation and magnificently restored by Darren Hunt and Jim Speed. Nowadays it is part of the Aire Valley Transport Collection. Just a historical puzzler… when was the the National Museum of Photography etc actually opened? After 1971, possibly. It stood empty for a long time, intended I think for use as a theatre. It became known as "Wardley’s Folly" after the City Engineer who planned it. Then the Museum came along, looking for premises, and the rest is history! In the early 50’s bus bodies got very smart, part possibly of a move to better design inspired by the Festival of Britain. The period piece on this one is the slopey windscreen- a Birmingham hangover? It’s my recollection that it was South Wales, rather than Rhondda, which had ‘tin-front’ Regent IIIs. I’ll stand corrected, of course. An interesting thing about the twelve Devon General examples is that after sale three turned up in West Yorkshire (2 Ledgard, 1 Longstaff) and I believe the Ledgard ones (in their short time with Ledgard, of course) regularly worked into Bradford from Leeds via Pudsey. A further three worked into what was at the time West Yorkshire, from what was Nottinghamshire (with Leon). The Museum, now the National Media Museum, opened on June 16 1983. I think John is correct that the tin front came out of Errwood Rd as a result of the collaboration with Birmingham. There are a very few minor changes, just as Leyland tinkered with the BMMO design for its tin front. You’re right David of course, it was South Wales and not Rhondda – I don’t know where that came from ! I remember both the Ledgard and Longstaff’s ex-Devon General AEC’s, I rode on all three and they were most wonderful buses – especially in the sound effects department as I recall. The Longstaff one’s aural delights were a little stifled though, as following a brief blast up Webster Hill out of Dewsbury it was never really able to proceed beyond a steady amble around the back lanes of Ravensthorpe and Northorpe. David – sorry to be pedantic – it was not West Yorkshire (a 1974 invention) but the good old West Riding of Yorkshire – later to become (in that area) another 1974 invention – South Yorkshire. As an eleven year old schoolboy, I remember with great excitement when some of these first "new look" AEC Regent IIIs entered service on the 1 November 1952. These were the first true "Humpidge" buses after prior taste of C T Humpidge influence with the Crossley re-bodied trolleybuses that had appeared in the previous March. I can confirm that the "tin fronts" were made and fitted at Crossley Motors at Errwood Park. I do recall seeing the final 15 chassis (91 -105) with "tin fronts" stored in the Tin Sheds at Thornbury as these buses entered service later in 1953. These final 15 buses did differ in appearance to the previous 25 (66 -90) buses as these were the first to have a blue roof in place of the mid grey which was the style used by the previous General Manager C R Tattam. The ‘new look’ or tin front certainly made buses so adorned look much more modern in comparison to those fitted with traditional radiators. Rochdale had a batch of Regent III’s fitted with virtually identical East Lancs bodies dating from 1951 but they had the traditional AEC exposed radiator and looked to be from a different generation than the Bradford vehicles despite being only two years older. I always found it interesting how the two adjacent Yorkshire cities of Bradford and Leeds had markedly differing vehicle policies. Bradford went early on for tin fronts and then froward entrances on the large fleet of Regent V’s while Leeds ploughed the traditional furrow with 7’6" wide buses until the 30 footers came, exposed radiators and rear open platforms for many years. The small batch of forward entrance Daimler CVG6’s bought by Leeds was I understand due to persuasion from Bradford to run forward entrance buses on the joint Leeds-Bradford route. If my memory serves me correctly, Glydegate was the last road in the UK to be newly wired for trolleybuses coming after the final Teesside extension. 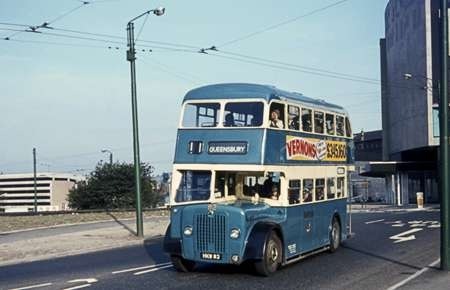 It served to allow inbound trolleybuses from Wibsey and Buttershaw to cope with road works and lasted until later in 1971 when the services were withdrawn. I always suspected that these new vehicles were so allocated for two reasons – one being that Heaton in those days was ‘posh’ (I wasn’t) and secondly Chaceley Humpidge lived in Heaton where he was a lay preacher at my local Church. A couple of years ago I renewed my acquaintance with 82 (which each year provides a shuttle bus service in Haworth for the annual ‘Forties’ war re-enactment weekend) by taking ride. Nostalgia indeed. Liverpool had some Regent IIIs with Crossley bodies with this radiator fitted. An interesting sidelight arises from Richard’s post and my earlier one on this thread. He refers to Errwood Park, I refer to Errwood Rd. When Crossley originally bought the site it was referred to as Errwood Park, though its location on the Stockport side of the boundary is across what is now Crossley Rd from Errwood Park which still exists and is in Manchester. In those days Crossley Rd was an un-named thoroughfare dividing Cringle Fields from Errwood Park and crossed the boundary between Stockport and Manchester, leading from Stockport Rd at Lloyd Rd to Errwood Rd itself. The Crossley site, bounded by the railway line and Cringle Fields, which eventually became a large number of football pitches on which I played many a match on a cold Sunday morning, was originally part of Cringle Fields a piece of open grazing land between Errwood Rd and the railway, so it may be assumed that Crossley wanted to give some elegance to their address after leaving the very industrial sounding Pottery Lane, Gorton and Cringle Fields sounded too agricultural whereas Errwood Park was more reminiscent of a country park! Most people I was brought up with in the adjacent area of Heaton Moor referred to Crossley’s Errwood Rd, though there was no entrance from that thoroughfare without traversing Crossley Rd! Fairey Aviation and later Fairey Engineering which occupied the site at various times always referred to it as Heaton Chapel Works, as did Stevenson’s Box Works who moved in after Crossley closed, Heaton Chapel being the suburb of Stockport in which the works was located. I wonder if the Errwood Rd usage was actually put about by Crossley whose very existence in the bus world was so dependant on Manchester’s patronage in the 1930s as Errwood Rd was in Manchester whereas the boundary between Manchester and Stockport ran along their wall built to divide the factory from the rump of Cringle Fields, Manchester. A 1970 copy of the Manchester A-Z interestingly shows the site all within Stockport with Errwood Park Works shown as the major part of the site yet the site where most buses were built is shown still as "Motor Car Works"! Dig the bones out of that. Philip H makes a good point about the divergent vehicle policies of Bradford and Leeds. I think I’m right in saying that Leeds had Regent Vs, but with exposed radiators. Why on earth would an operator wish to remove such a graceful and well proportioned front end to revert to the ‘old fashioned’ look of an exposed AEC radiator. Nothing wrong with the exposed AEC rad, but surely it had had its day by the time the Regent Vs came along. The Liverpool Regent III’s had a different tin front unique to Liverpool. It was virtually a full width bonnet and incorporated the front mudguards more on the lines of the Leyland BMMO front than the Birmingham design. There’s a picture of one of the Saunders-Roe bodied buses with this front under the Liverpool link on this website. Ken, Somewhere in my mind is the idea that Glydegate was the last public highway in the UK to be wired for trolleybus operation. The road layout at this point was a gyratory: Little Horton Lane between Princess Way and Glydegate was one way from Princess Way, and Morley Street was one way from Glydegate to Princess Way. Glydegate acted as the road connecting the top of the one-way sections of Little Horton Lane and Morley Street. According to Stanley King’s book ‘Bradford Corporation Trolleybuses’ Glydegate came into use on 18 May, 1969. The shot of number 82 on service 11 to Queensbury must have been before 1 March 1971 when the services were recast and the joint services to Halifax came into operation. Leeds stuck with exposed radiators until the manger changed in 1961 this was due in some part to ease of maintenance. After that all buses were tin fronted or rear engined Philip mentions the front entrance Daimlers these 5 buses were considered so non standard they were offered for sale in the late sixties In the event they hung on to be the only Leeds buses to be allocated to all four divisions of the PTE and the only front engined Leeds buses to wear PTE livery 574 has been restored and often appears at rallies. There is a picture on this site of a Doncaster Regent 5 looking like a 3 with exposed radiator. They stuck with them, too the last front engined Titans in the mid 60’s had exposed radiators like the recent Stockport posting. I think it was also a sort of macho thing like Atkinson lorries. The use of exposed radiators was by no means a "macho thing". Proponents of the exposed radiator point to easier maintenance access, better driver visibility and better cooling, so much so that when Daimler insisted it would not provide exposed radiators and Manchester was not impressed with the tin front offered, it eventually designed its own concealed radiator for its Daimlers which was all but a reversion to the dimensions of the exposed radiator and was such a success that it was adopted by the manufacturer as its standard. I stand corrected over the Liverpool Regent IIIs. Well it is over 50 years since I’ve seen one! I agree with Joe – tin fronts = mutton dressed up as lamb if you ask me! There doesn’t seem to be that much (anything?) on Glydegate at the time the photograph was taken! For the past few years I’ve driven past a similar street in Bradford, which amounted to no more than a left-turn slip road at a set of traffic lights – no buildings on either side – but retained its street name. I think Chester Street (of WYRCC bus station fame) may still exist in this sort of vestigial format – though I’m not certain that the name remains. From the first time I saw one I always thought that there was "something" about the Manchester-fronted CVGs of Bradford and Huddersfield (Leeds was unexplored territory in those days! ): as much as I tried to stay loyal to AEC/Hebble I still have to admit that – much like Clodagh Rogers – those Manchester-fronted CVGs looked classy. St Helens front on Bradford’s PD3s was "industrial" or just plain ugly – like, like . . . Anyway, for Glydegate to be able to claim that it was last road to be wired for trolleybus operation seems to be stretching things for was by then just part of a gyratory system. I have very fond memories of conducting 82 even though I never had the pleasure of working for BCT. "Well then what’s he talking about" you may understandably ask !! This superb vehicle played a welcome and major part in the 40th anniversary commemoration running day on 14th October 2007 marking the sad end of the Samuel Ledgard era. The fifteen hour running extravaganza culminated in a simulation of the 23:00 hours departure from Leeds to Ilkley via Guiseley – a journey performed very appropriately by the preserved Bradford RT – the real thing forty years earlier featured HLX 157, a Ledgard RT, which ran out of fuel a mile short of the Ilkley terminus. That circumstance, unheard of normally in Ledgard days, remains a mystery to this day. The Bradford RT was made to simulate a similar failure at the same spot. 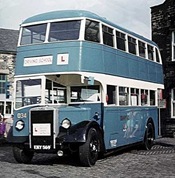 In 1967 the RT was replaced by Ledgard’s own 1953 U, a Mark V Regent, but in 2007 Bradford 82 played the part having "been summoned from Otley depot." So there we have it, 82 completed the journey to Ilkley and then operated the late running 2355 from Ilkley to Otley. I had been conducting all day from 09:00, mainly on the superbly restored MXX 232 (RLH 32) so very kindly provided in perfect Samuel Ledgard livery by Timebus of St. Alban’s. The feeling of "deja vu" in that last couple of hours was almost unbearable, but nevertheless I felt very honoured to be asked to do it, wearing my genuine Ledgard uniform and using an actual Otley depot Setright which I own. I always considered Hull’s "tin-fronted" Weymann bodied AEC Regent IIIs (336-341) to be the city’s best looking buses until the dual door Atlanteans came along in 1969. The overall body profile combined with the typical upswept bottom panels and the front end resulted in a very handsome bus one of which can be seen here. This discussion makes me wonder if there would ever have been such a thing as a tin front if it hadn’t been for Midland Red uniquely combining the roles of chassis designer, body designer and operator. Being in the vanguard of underfloor-engined development, which revolutionised the appearance of single deckers, it was probably inevitable that they would do something with their double deckers as well. Then I suppose BCT, seeing all these modern apparitions coming in and out of their city, felt obliged to keep their end up by doing something similar, and it all took off from there. I remember being very impressed as a youngster with the tin-fronted PD2s of Oldham and Southport. But ultimately, as so often happens, something which was designed specifically to create an appearance of modernity in its own time ends up rapidly becoming very dated. This Driver Training bus is seen shining in the sunshine outside Thornbury Depot at an open day in September 1973 a few months prior to the formation of West Yorkshire PTE. It appears to be in splendid condition for its age. Records show its withdrawal from normal service (as fleet number 569) in 1965 so it had a long innings as a driver trainer. These Leyland PD2/3s were a batch of 20 bought in 1949/50. The last ones were 20 years old when they were withdrawn in 1970. A mere 2 years before the 1961 AEC Regents. Somehow I don’t think todays replacements will be around in twenty years time! 558 from the same batch is preserved. Last time I saw it, it was undergoing major body restoration at Sandtoft but was in running order. 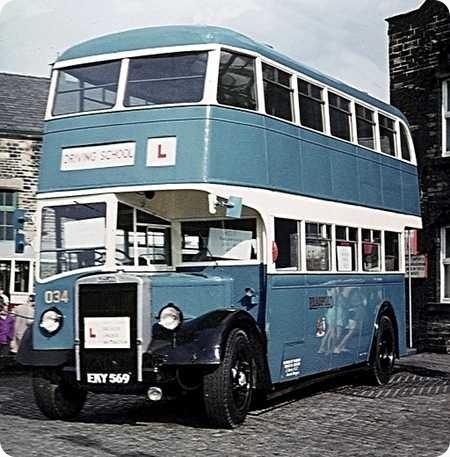 It spent it’s early preservation years taking members of the West Riding Transport Society to rallies and towing the society’s preserved trolleybuses around, a duty shared with Guy Arab II ex County 70. I may upset a few people here, but I’d like to venture to suggest that Bradford Regent Vs 121-5 were withdrawn in 1972 not because they were worn out, so to speak, but simply because Bradford had a surplus of vehicles at the time – Fleetlines 336-55 being more than enough to see off the last Regent IIIs. The earlier Regent Vs, 106-20, would have been past their second recertification at the time. It has been inferred elsewhere that AV590-engined Regent Vs were a disaster, but AV590 engines continued to be fitted, almost to the end of production, and I’m not aware that Regent Vs generally had a short life – they seemed to last just as long as contemporary PD3s, Arab Vs, and CVG6LXs. One thing which does seem untoward is the quoting of EKY 569’s lower deck seating capacity as 27, rather than the more usual 26. Yes, this is consistent with the Peter Gould site, which asserts that all of the batch (554-73) were upseated to H33/27R in the mid-fifties. 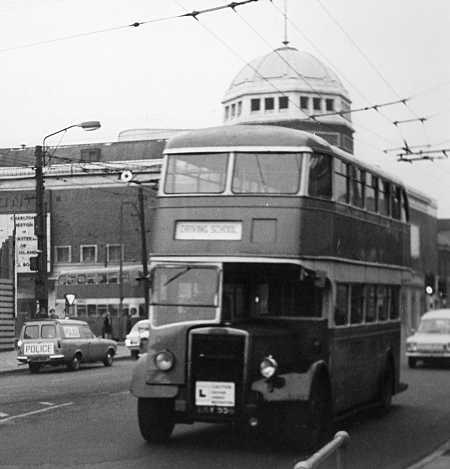 Most or all of Bradford’s post-war motorbuses were upseated in the mid-1950s, but no other batch apparently had the lower deck capacity increased to more than 26. This includes the 41-65 batch of PD2s, which must have been virtually identical to 554-73. A lower deck seating capacity of 27 implies a rearward-facing seat for five behind the bulkhead, and I can’t recall this as being a feature of any Bradford buses. David. As one of AECs biggest fans, I would concur that all wet-liner AECs (470 and 590) were not as good as the A2** that preceded them nor the 691/760 that followed. I have long been puzzled, along with folk such as you, as to the vilification of Bradford Regent Vs. Sheffield’s terrain is as bad as, if not worse than, Bradford’s. Over a 100 590 Regent Vs gave sterling service – and a full service life – in and around the city and were quite frankly superior to the (very good) PD Titans let alone the typically iffy PDR1 Atlanteans. Was there something in the Bradford air that disagreed with the Southall fuel system? No David, none of Bradford`s buses had a rearwards facing seat, even after "upseating" I also believe that 121 – 125 were withdrawn due to their extra high fuel consumption. The Titan PD2/3s came in 2 batches, 554-573, and 41 – 65, the later batch not having the front upper deck rain shields, and thus having a more up to date look. Both batches of Titans looked absolutely superb in their original "Tattam" livery, with yellow lining, cream bands, and grey roofs, the livery to which the preserved example is, I believe, returning. Bradford`s operating and maintenance staff highly praised the Titans, and rightly so, BCPT was never really a "Leyland" fleet, the previous Titans being of the TD1 type, and subsequent ones, in 1967, of the PD3A variety, and consequently, they always had something of a "separate" feel about them amongst the more numerous Mark 111 Regents. This photo brings the memories flooding back! I always preferred a downstairs ride on a PD2, as the tickover "gurgle" used to fascinate me along with the other magnificent sounds, and the sight of the "Leyland metal framed body" badge is something else etched into my memory! Wonderful, high quality vehicles! It is the very essence of informed transport enthusiasm for each of us to have especial fondness for a particular marque or model, and this site thrives upon the diversity of discussion that arises from individual preferences. I personally felt that the Mark V Regent, particularly the noisy synchromesh version, did not measure up to the standards of the older Mark III in a number of respects – sacrilegious, I know, but my favourite Regent Vs were the preselective Gardner powered Rochdale examples – but the views of others offering a different opinion are equally valid. Whatever its shortcomings, real or imagined, the Regent V was not a commercial or operating disaster, and it served many operators faithfully for several years. David Call’s explanation for the seemingly early withdrawals of the Bradford examples seems a little strange to me. No properly run operation would wake up to find itself holding an unplanned surfeit of vehicles, thereby necessitating the early withdrawal of entirely serviceable stock. The earlier than expected demise of buses such as these, by no means only in Bradford, surely arose from the introduction of the New Bus Grant Scheme in the 1968 Transport Act. 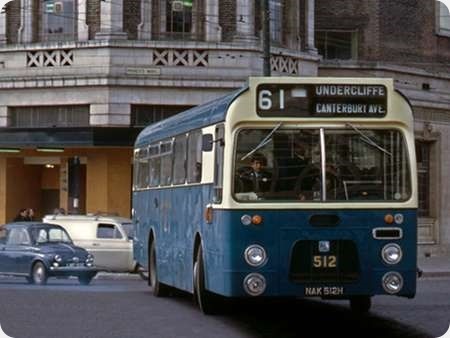 The opportunity of buying a new bus at half cost was seized upon by all operators throughout the bus industry, and perfectly sound Leyland Titans, Guy Arabs, Daimler CVGs as well as Regent Vs, were pensioned off early. Certainly, the Regent V could probably give most of the modern, tinny, lurching buzz boxes a good run for their money, and probably achieve that result at a lower cost in maintenance and fuel. 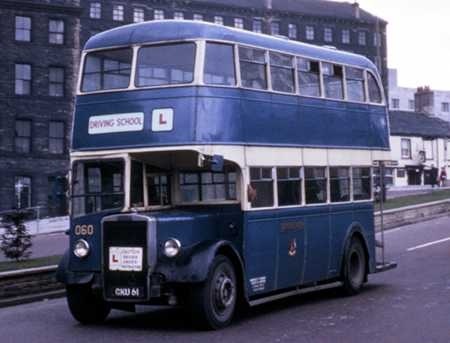 Here pictured in April 1970, again on training duties, is one of the later batch of Leyland H30/26R bodied PD2/3s, GKU 61, delivered in 1950. This bus presents a bit of a puzzle. According to Peter Gould, the fleet numbers and registrations matched, which should make this bus No. 61, but the fleet number 60 is clearly displayed. Do our experts have an answer, please? Bradford’s "0" series numbers were specifically for what they called service vehicles, such as tuition buses, grit wagons, tower wagons etc, and had no connection whatever with the fleet numbers of passenger stock. Many thanks, John. That explains it. This site is a goldmine. The AEC engine types that David Oldfield refers to as predecessors of the AV470/AV590 were the A208 and A218. The A208 was the original engine fitted to 9612E/9612A which was found to run hot when driven ‘hard’ and the A218 had an external water pipe feeding coolant to the rearmost cylinders to overcome this. The engine fitted to the Regent RT was the A204, which also received the external water pipe modification but without any change to the type number, which remained A204. Bradford borrowed some AEC Regents from Huddersfield in the final months before the formation of the PTE. This may have been in part due to vehicle shortages as Bradford decided to buy no more new vehicles after 1972 as they were not in favour of the PTE and did not wish to furnish it with new stock. Certainly in the early years of the PTE a number of Leeds Daimlers saw service in Bradford to cover shortages. There are comments elsewhere on the BRADFORD thread about changes to the livery. Some apparent changes are caused by the lighting conditions, the film or the way it was processed – for example, I have a Royal Blue coach next to a Birmingham PS2 in one photo, and they both look alike, whether they were or not in reality. In the views above, are they really different shades of blue, or is there an outside factor? Nice views, by the way! Are the colours of these two buses supposed to be the same or is it a photo thing? If the same, which of the two is the more realistic? Both of these beautiful vehicles are presented in a way that would disgrace many modern operator – and they were only for driver training at the time! Well done, Bradford. I said I might upset people – I probably have, but I’ll probably upset a few more yet. AEC’s 470/590 engines may well have been widely criticised, but they must have had something going for them, or they wouldn’t have been introduced, and operators wouldn’t have bought them by the thousand. I don’t think Bradford’s Regent Vs were universally disliked – Stanley King may have disliked them, and he was inclined to make his views known. As for Bradford 121-5 having excessively high fuel consumption, I’ve heard this one before – but why would they be any more thirsty than 126-225, which had the same engines? The two-pedal control wouldn’t have made any great difference. I’m now going to take Roger Cox to task for his criticism of my suggestion as to why 121-5 were withdrawn when they were. At the height of the bus-buying boom (prompted by the ‘bus grant’) there was a two-year waiting list for new buses – any operator who could accurately predict how many vehicles would be coming due for replacement in two years time would need not only good business sense but a degree in clairvoyance. To have predicted within five, for a fleet of over three hundred, doesn’t seem bad to me. Don’t forget that operators were more likely to err on the side of underestimation – and finished up keeping vehicles they had been planning to dispose of. As Chris says, the Bradford Blue has come up before. Years ago, I had problems trying to obtain a consistent blue in silk screen work, and eventually those who knew told us that blue was a translucent colour (or somesuch) and it depended on the colour of the primer. On the other hand, 35mm colour film did vary: I think Fuji was bluish and Kodak reddish- perhaps! Another picture of a PD2 in the Bradford Training fleet. I took this hurriedly composed shot around 1969/70 but can’t quite make out the registration number. It looks like EKY 55? Can anybody positively identify it? Re film colour. I’ve been shooting aircraft on AGFA, Fuji and a much smaller amount on Kodak slide stock since the early 1970s. I also have a fair number of prints/negatives from various film types. I’m currently scanning around 14,000 aircraft slides, 2,000 prints plus all the family photos using an Epson V700. Colour rendering and quality varies. The Epson tends to scan to a blue bias whilst Fuji slide stock of the period has an inherent green tinge. Agfa tends to a slight red and, if the slides have suffered from age, those tendencies are amplified. Kodak is a nightmare to scan and, thankfully, forms the minority of my shots by a long way. I find that I have to do some colour work in Photoshop with most slides older than 15 -20 years. Blue as a colour does have inherent pigment problems. I was a regular visitor to Bradford from a young age and there was always some difference in shades between their buses in the same way as the off white of Stockport’s scheme changed with not very great age. Am I right in thinking that the shade of blue in later years was deliberately darker than in the early – mid 1950s possibly to overcome fading? Going back to the comparison between the two photos I’d say, looking at the sky, that Ian’s photo is slightly overexposed either in the original or in scanning but the blue, were the colour temperature and exposure corrected, would approximate to an 1950s blue. Roger’s photo also has the sky over exposed, presumably to have enough exposure for the bus, but the green of the grass is more accurate. Having said that the blue red balance is out (look at the road surface and the various windows) so the blue of the bus will also be out. This: www.flickr.com/photos/1 illustrates how the colour is affected by light and shade and is closer to Ian’s shot. Here is the same bus on a grey day: www.flickr.com/photos/2 which is how I remember the colour (perhaps it was always grey when I went to Bradford (!) but again shows variation and is closer to Roger’s shot. Also look how much richer the cream is in the first of the Flickr shots compared to the second and the shots in this thread. Unfortunately the variation in film stock, exposure, processing and scanning is not going to help either justify or correct our memories where such issues arise. The only way to know for sure is to obtain the colour number used for the paint and then try to find a colour chart. The last six months of BCT was not a period of great glory. Last week I met some friends in Leeds from my days in the bus industry at that time including Brian Eastwood, who was then Assistant Traffic Superintendent at BCT. Brian reminded me of the day that the Chief Engineer, Bernard Barrington Brown [who was known as ‘B-cubed’] announced that there was a vehicle crisis. John Hodgson Hill, the Traffic Superintendent, then set Brian and Chief Inspector Fred Wilkinson the task of selecting running boards (vehicle schedules) that could be dropped. I seem to remember that eventually a list of boards that could be dropped was agreed upon and Arthur Wheet, who operated the address-o-graph and printing machine on the 6th floor of the Head Office at Forster Square, produced the necessary passenger notices of journeys that would no longer be operating. As I recall the problem came in part from a large number of vehicles requiring re-certification and I seem to remember that a great many of the first batch of 15 Leyland Atlanteans delivered in 1967 were out of service during the period immediately prior to the PTE taking-over. Some interesting comments about colour rendering! It may seem a silly question – but I’m from British West Bradford, not the Yorkshire one, so I think I have an excuse! – is the 0 series a number or a letter? I think the "0" is a number, Pete, not a letter, but I do not really know, and does it have any significance anyway? !!. Regarding the shade of blue. This was adopted in 1942, inspired by the loaned Southend trolleybuses, and never as far as I know, altered until the demise of BCT in 1974, although it is possible that changes occurred as paint ranges changed, evolved, or improved over the years. There always seemed to be a pigment problem, with great shade variations, some buses taking on a distinctive turquoise hue as the paint aged between repaints. This was particularly apparent with certain vehicles, 611 being notoriously remembered. It must also be remembered that the industrial atmosphere changed for the better in later post war years, with less acid based colour deterioration. I also well remember the BCPT practice of "TUV" , where little black letters above the platform exit referred to the date of the last "touch up and varnish". There was nothing smarter than a Bradford bus straight out of the paint shops, but, unfortunately, they never retained this shiny smartness for long! 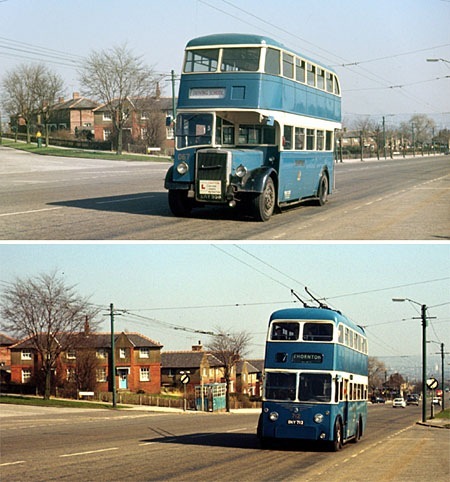 Strange too, that the "new blue" was adopted in wartime, when many motorbuses were decked out in khaki, but I believe that trolleybuses were not subject to quite the same WW2 restrictions as were motorbuses. It will be difficult to answer that one! I have a typed and duplicated official Bradford fleet list from the period and this shows the vehicles as "O.60", but unfortunately that particular typewriter used the same character for the number and the letter, so you just can’t be sure. However, a letter would make more sense if you put the full stop in. As far as I can make out though, it never appeared on the vehicles themselves. The subject of Eric Bawden’s photo is EKY 556. This was formerly fleet number 556. It was transferred to driver training duties as 067 in December 1970, was renumbered 033 in April 1972 and was sold for scrap to Hartwood Exports in February 1974. Pete, does that mean you are really the Clitheroe Kid? No, Phil, but a former boss (the one who told me the Geoff Hilditch version of the advent of the Dennis Dominator, having worked with GH at one time) was. He looked too much like Eric Morecambe for his own good and was rather accident prone, but that’s another story altogether! Thank you for that information, Michael. If you look carefully you can just make out the fleet number 067, something that doesn’t show up on the original! From what you say I think I must have taken it in 1971, whilst on trolleybus photography ‘duty’. In the early 1960s I attended school in Harrogate Road Bradford. One school special was provided by Bankfoot depot, usually an EKY PD2 or now and then a PKY Mark V. Normal services from Ludlam Street depot were RTs/HKW Mark 111/GKU PD2s. One bus which seemed to perform the best was PD2 573 even with a full load it seemed to power up the hills. Does anyone know if any modifications were made to the O.600 engine to improve performance. I think 573 was the last PD2 to be withdrawn in 1969. Nothing special about 573 that I am aware of Geoff. I often rode on this batch in their later years, sometimes as duplicates on the 80 route in the Mk V era, and I was, like you, always amazed at their performance. They could all, both batches, have soldiered on for another 20 years or so! In their earlier years, they absolutely "flew" up Manchester Road, so that you thought, apart from that superb "gurgling " sound, that they were trolleys! Wonderful buses. Phil has given an excellent resume on colour, but Bradford blue and similar were prone to shade changes due to weather and also what base coat was being used under the blue. Although the blue would have been specified to the Paint suppliers whose tolerances would have been slightly different, the base coats could vary enormously – sometimes referred to as batch to batch variation, but often due to using a cheaper less opaque filler.After university I worked 4 years in surface coatings and was given the job to match the white from an artist impression of the new Hartley’s jam jar. Despite us having hundreds of shades of white I had to start from scratch and can remember adding some yellow and then a drop of black to make it look cleaner. Later I would work 8 years for Bayer who at the time owned Agfa so nearly all my slides used Agfa film as we got them at staff prices. These days as a modeller Bradford blue still causes problems – manufactures saying the model is finished in Bradford Blue. There is no modelling paint which is a direct match for these vehicles – you are advised to make up your own colour blend, or like me don’t chose to paint your bus Bradford blue – stick to Tilling Green which is much easier and readily available. Some paint colours are unstable. I moved into a house with a bluey colour on the window frames which needed repainting. The garage had a couple of old tins of Ripolin turquoise and I decided to repaint the frames, which finished up an accurate turquoise colour. After about two years, however, it had returned to the colour I first saw. Part weathering, but perhaps part salty air, being half a mile from the beach. However, the latter was not an influence in Bradford! My recollection of the Hartleys’ jars were that the new shape only held 12ozs rather than the earlier one pound jars, but costing the same. But maybe that was on another occasion. Following on the question of colour, particularly Phil’s earlier comments, this montage photo shows just how dependent we are on our subjective assessment. The two views are consecutive, taken just a short time apart, at the same location, in the same lighting conditions and of course on the same film. The two slides have been stored in identical conditions, but in separate boxes. The film is one of my rare forays away from Agfa, being Fujicolor, and has survived reasonably well in terms of colour casts. The originals look a bit brownish in the shadows. The difference in the outcome is due to the fact that they were scanned at very different times, although with the same scanner. The trolleybus was scanned in 2003, the PD2 4 years later. The trolleybus was one of my early scans, before I had become fully versed in what could be done in photoshop. It is definitely over-saturated when I now look at it, but it must have seemed OK at the time. Scanners do have a tendency to increase contrast relative to the original. The PD2 is perhaps a bit undersaturated, but looks fairly true-to life in terms of colour balance. The shade of blue doesn’t look to bad. The photo’s were taken on the last day of normal trolleybus service, 24 March 1972. The PD2 as well must have been close to the end of its working life, being already 23 years old. Quick comment on Hartley Jam Jars as I spent so long working on them – they were 12oz at request of shoppers who complained about having to buy 1 pound jars of things like Robertsons Jam, although some shops sold half pound jars of their marmalade. Initial pricing reflected that the Hartleys jars were smaller, then supermarkets moved prices to be same as lb jars, so Chris is right in remembering prices but other supermarkets just gave up and reduced the price of the Hartleys jars to clear space. He’s definitely right about paint being unstable both in settling out and application. Our back faces south and the colours are never the same as the front although black & white has worked best – we have had blue & white and currently red & white – think we might just go for white only next time. There are so many variables with paint colour. Memory doesn’t help nor, I understand, do some of the modern pigments which have different chemical properties to those of 40-60 years ago. I’m told that even using the same colour numbers to the same mixture cannot guarantee a match and then, of course, there is the absence of lead which would have been used in the white base, certainly prior to the 1960s. As far as Alan’s pics go, to my eye neither is spot on and they illustrate the problem with scanners as the trolley is over saturated, the PD2 is about right for its age but the grass and houses look too pale. It wasn’t any simpler in the days of black and white. Red, for instance, could be rendered on film in good lighting conditions as anything from light grey to the deepest black depending on the film used. Well, what a range of colours when one looks down these posts! The original photo may not be accurate, but is probably my favourite, albeit allowing for my colour-blindness. But then, after red, my favourite colour is among the greys and I mean this most sincerely, folks. Now you’ll tell me it’s green! And that gloss on the lower deck panels – very impressive! I was born about half a mile away from this location, and both blues look pretty good to me! In reality, as has been stated before, BCT buses demonstrated great variations when it came to shade and gloss, as the colour did not wear well. However, there was no finer sight than a BCT vehicle straight out of the paint shops! I firmly believe that such speedy deterioration was worsened after the appointment of Mr Humpidge, in late 1951. He sought to reduce costs, and rightly so, but his elimination of cream bands, yellow lining, and later, grey roofs, seemed to emphasise this deterioration. The full glory of the earlier "Tattam" livery is a sight to behold, as can be witnessed on 746 at Sandtoft, but the irony is that the pre-war Prussian Blue was not so prone to deterioration. I was brought up though, with Tattam`s "New Blue" as inspired by the Southend loans, and I have this livery etched on my psyche from childhood! To me, the perfect example of a classic livery. Catching up with the threads on Bradford City Transport, I am not the only one to have heard the reasons for the early withdrawal of Regent Vs 121-125 and do believe it was because of higher fuel consumption caused by Monocontrol gearbox, which is the old Automatic v Manual car argument. Bradford Regent Vs received very bad reports mainly because the injector pipe clips were not replaced at overhaul, and the subsequent vibration caused pipes to fracture. I am told by someone in the know that a fitter was stationed in the city centre on a full time basis. The problem was later solved by re-designing the pipe ends so they were more akin to Gardner injector pipes. Having had the problem occur on preserved example 6220 KW, for the same reasons, I can assure readers that it still happens!!!. Most wet liner engines are suspect as the seal between cylinder block and cylinder liner is of vital importance in not allowing water into the sump. AV470 and 590 are no different to Bristol BVWs in this respect and they suffered from similar problems. On the subject of fuel consumption, BCT 224 and 225 were experimentally fitted with AV690 engines. Needless to say the experiment did not last long and no other vehicles were converted. The Dennis O4 and O6 engines were of wet liner configuration, and reputedly gave very little trouble, despite being of advanced design with four valves per cylinder and having the timing gears located at the rear of the block. The post war smooth running O6 in particular proved very reliable, and became popular with independent operators who had only basic workshop facilities for maintenance, so it would seem that the engineering skills at Guildford were not matched by manufacturers elsewhere in Britain. Mr Anon mentions the Scalia which ran in Bradford These were originally ordered by Leeds but all were diverted to Bradford by the PTE Like all Scalia Metropolitans they were very prone to corrosion and had quite short lives with the PTE.